Researchers at the University of Pennsylvania and around the world will now have access to advanced weather and lightning data, thanks to a collaboration between the Wharton Customer Analytics Initiative (WCAI) and weather data company Earth Networks. 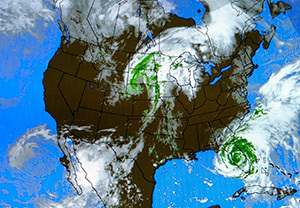 Weather-related course curricula and materials. "Our relationship with Earth Networks is a game-changer in providing our faculty and student researchers with access to real-time weather data and analytics," said Eric Bradlow, chairperson of Wharton's Marketing Department and co-director and co-founder of WCAI, in a statement. "The combination of Earth Networks weather intelligence data and our data analytics resources will spur the development and application of new applied predictive models for a wide range of commercial sectors, and offer the University of Pennsylvania community unprecedented weather data access."